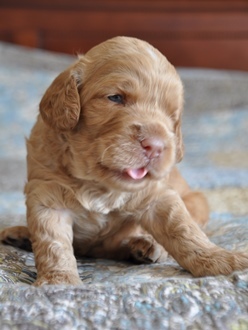 In 1988, Wally Cochran of The Royal Guide Dogs in Victoria, Australia produced the first ever litter of Labradoodles. This litter came about in response to a request by a blind lady in Hawaii who needed a guide dog that wouldn’t aggravate her husband’s allergies. Hair and saliva samples from dozens of poodles were sent to the couple to see if they would cause an allergic reaction. Unfortunately, they all bothered him. With permission from the management of The Royal Guide Dogs, Wally crossed one of their labs with a Standard Poodle. This cross produced the first litter of Labradoodles. Three puppies were born, one of which didn’t bother the husband’s allergies. This pup went on to be a wonderful Guide Dog and companion for the couple. Here at Labradoodles of the North, we like to carry on this tradition by producing pups that go on to become service or therapy dogs. 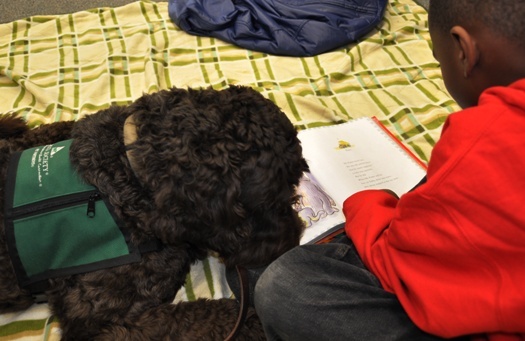 The picture below is of our boy Zeus, reading with children at the local elementary school. In our search for the perfect family pet, we looked at a lot of different breeds. It seemed to me that each dog we considered was bred to DO something: hunting, herding, retrieving etc. We don’t live on a farm so we don’t need a dog to herd our sheep and we aren’t looking for a hunting dog. Our top priorities were that the dog be allergy friendly, great with the children, non-shedding, and big enough to be active with our family. We wanted a great family companion! Labradoodles were originally bred to be therapy dogs for those with allergies. A dog bred for this type of work makes an excellent family companion, not to mention that my allergies didn’t bother me and I wasn’t having to continuously sweep up hair before my crawling baby got it between his litter fingers. We’re overwhelmed at how easily an Australian Labradoodle fit into our family and lifestyle.